*M.A Student, Department of Accounting, Zanjan Science and Research Branch, Islamic Azad University, Zanjan, Iran. Received: September 04, 2013. Revised: December 09, 2013. Accepted: March 17, 2014. Purpose - This study aims to examine the incremental informationcontent of cash flw from operations and earnings inthe Iranian capital market. Design, methodology, and approach - Based on market-basedaccounting research, this study uses statistical associations betweenaccounting data (earnings and cash flw) and stock returnsto assess/measure the incremental information content (valuerelevance) of cash flw and earnings. A multivariate regressionmodel based on panel data is used to examine the incrementalinformation content of earnings and cash flow from operations. Results - The results show that both earnings and cash flowfrom operations have incremental information content beyondeach other. These results are consistent with the findings of recentstudies. Overall, the fidings of this study support the usefulnessof cash flw information in addition to earnings, in fimvaluation by investors in the Iranian market. Conclusions - The study makes the following contributions tothe Iranian literature on incremental information content of cash flw and earnings. First, this study employs actual cash flw dataderived from cash flw statements. Second, this study employs alarge sample size for a more recent period. JEL Classifications : G17, G32, G35. As an information system, accounting has products for achieving a set of goals. The main goal of accounting is to provide useful financial information to users to help them in making decisions, and financial statements are the main tool for communicating this information. An important element in financial statements is earnings. Earnings have always been used by investors, managers, and analysts as a signal for payment of dividends, a measure for effective management, and a tool for evaluating decisions. In recent years, researchers and investors have shifted their attention from accrual to cash-based accounting. Cash flows are useful in risk assessment, interpreting net income, assessing firm performance, and providing additional information to the stock market. Cash flow from operations, along with earnings, is an important measure of firm valuation. The use of cash flow indicators has always been underlined by the accounting community. According to the Statement of financial Accounting Concepts (SAFC), one of the purposes of financial reporting by businesses is to provide information to investors and creditors to help them in predicting amounts, timing, and uncertainty of future cash flows (Fanatical Accounting Standards Board, 1987). The present research tries to measure the incremental information content of cash flow and earnings in the firms listed on Tehran Stock Exchange (TSE). Figure 1 shows different conditions of the possible relationship between cash flow and earnings information. Condition 1 is when earnings and cash flow both have important information and they both have incremental information content over each other. Condition 2 is when both earnings and cash flow have important information, but none have any incremental information content over the other. Finally, condition 3 is when only one variable has incremental information content over the other (Arab-Mazar Yazdi, 1995). Since 1996, the incremental information content of cash flow and the study of accruals have had a special place in the accounting literature. This may be due to the debate over the importance of cash versus accrual-based accounting. Most studies on the incremental information content of cash flow and accruals have shown that these measures are valued differently by investors (Mostafa & Dixon, 2013). Previous studies provide much data about the information content of cash flow and accruals. Neill et al. (1991) reviewed the research on the incremental information content of cash flow and accruals (e.g. Bernard & Stober, 1989; Board & Day, 1989; Board et al., 1989) and documented the incomplete and inconclusive results of these studies regarding the incremental information content of cash flow and its role in stock value. Based on market-based accounting research, Mostafa and Dixon (2013) used the associations between accounting data (earnings and cash flow) and stock returns to examine the incremental information content of cash flow and earnings. They studied 1916 firm-year observations from 1995 to 2002. They showed that both earnings and cash flow from operations have incremental information content beyond each other. Ali (1994) examined the incremental information content of earnings, working capital, and cash flows. He documented the incremental information content of earnings over working capital and cash flows. He also showed that the incremental information content of earnings, working capital from operations, and cash flow from operations declines as the absolute value of changes in these variables increases. Haw et al. (2001) investigated the relative and incremental information content of earnings, operating cash flows, and accruals in the emerging capital market of China. They showed that earnings have relative information content over operating cash flows. They also found that discretionary accruals provide incremental information beyond that contained in nondiscretionary accruals. Wilson (1987) investigated the extent to which cash flow and accrual components of earning contain information that is incremental to that contained in earnings alone. The results showed that cash from operations and total accruals, together, have greater ability to explain stock returns than bottom-line earnings. Charitou et al. (2001) examined the relative information content of earnings and cash flows for security returns using a UK dataset. Their sample consisted of 3364 firm-year observations from 1985-1993. Although their results emphasized the value relevance of earnings, they also suggested that both contemporaneous and prior period cash flow are positively related to security returns. Trabelsi (2013) examined the value-relevance of earnings, cash flows from operations (CFO), and funds flows from operations (FFO) in firms listed on the Tunisian stock market. His study was based on 248 firm-year observations from 1996-2009. The results showed that all three performance measures have explanatory power for returns individually and that earnings perform better than cash flows in explaining security price variation. She also showed that earnings having incremental information content beyond CFO and FFO, that CFO is having incremental information content beyond earnings, and that FFO having no incremental information content over earnings. Cheng et al. (1996) focused on the incremental information content of cash flow from operations and earnings. They showed that both earnings and cash flow have incremental information content beyond one another. Arab-Mazar Yazdi (1995) examined the incremental information content of cash flows and accruals. The results suggested that accruals had incremental information content over cash flows. In 2006, Arab-Mazar Yazdi studied the information content of cash flows and earnings and provided evidence that earnings were incrementally informative over cash flow from operations. They also reported the incremental information content of accruals over cash flow from operations and discretionary accruals over non-discretionary accruals. Tehrani and Fani-Asl (2007) investigated the relationship between cash flow from operations, accruals, and the stock returns of firms listed on TSE. Their sample consisted of data from 43 firms during the period 1999-2001. The results showed that accounting profit has incremental information content over cash flow from operations and that it is the most important accounting variable in financial and investment decisions. They also reported a significant relationship between cash flow from operations and stock returns, suggesting that operating cash flow has found its way into the decision-making models in this market. Pouraghajan et al. (2012) evaluated the relative and incremental information content of earnings and operating cash flows in TSE-listed firms. They studied sample of 475 firm-year observations during the period 2006-2010. The results indicated that earnings have more information content than operating cash flows in explaining stock returns. The hypotheses are tested using the data collected from sample firms and multivariate linear regression. Considering the type of data, a synthetic dataset is used to test both hypotheses. Thus, first F test is conducted to choose between mixed and panel methods. If panel data is selected, the next step is to perform a Hausman test to decide whether to use a fixed effect or a random effect model. If the null hypothesis is not rejected, the random effects model is preferable. The independent variables of the research are cash flow from operations and earnings and the dependent variable is stock returns. Hypothesis 1: Earnings have incremental information content beyond that of cash flow from operations. Hypothesis 2: Cash flow from operations has incremental information content beyond that of earnings. 1. The firms must have been listed on TSE during the entire studied period. 2. Financial intermediaries and insurance and investment companies are excluded. 3. The financial year of the firms must end on March 20. 4. The firms must have no change in their activity or financial year. 5. These firms must not have stopped transactions for a long period (more than 3 months). Rit is the stock returns of firm i in year t, ΔEit is the changes in earnings (ΔEit = E-E-1), ΔCFOit is the changes in cash flow from operations (ΔCFOit = CFOit-CFO-1), Eit is earnings, CFOit is cash flow from operations, and εit is the error term for firm i in year t.
The following table provides the descriptive statistics of the studied variables, including the number of observations, mean, standard deviation, and minimum and maximum observations. The statistical tests used in this research are F test, Hausman test, test of autocorrelation in the regression model, and estimation of the regression model. 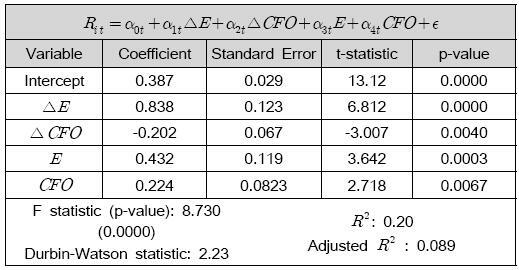 Considering the results in Table 2, the F statistic is 1.28 and the significance level is 0.010 (p＜0.05). This suggests that the null hypothesis is rejected and that the panel data is significant. On the other hand, the results of Hausman test suggest the efficiency of the fixed effects model compared to random effects model. Therefore, panel data with fixed effects are used to estimate the regression model. As in time-series data, panel data can be subjected to autocorrelation. Durbin-Watson statistic is employed to detect the presence of autocorrelation in the residuals (Table 3). Durbin-Watson statistic is between 1.5 and 2.5, suggesting the absence of autocorrelation in the regression model. Thus, the results of estimating the first and second hypotheses are provided in Table 4. The calculated F is greater than the table value of F and its significance level is less than 0.01. Therefore, this model is significant at 99% CI. In other words, the model has high validity. In addition, the adjusted coefficient of determination is 9 percent, indicating that 9 percent of changes in the dependent variable explained by the independent variables. Moreover, the Durbin-Watson statistic is 2.23 which between 1.5 and 2.5, suggesting the absence of autocorrelation in the estimated model. The p-value of earnings is 0.0003 which is less than 0.05, suggesting that earning is significantly associated with stock returns. Since the coefficient is positive (0.432), these variables are positively associated, which was theoretically expected. As for cash flow from operations, the p-value is 0.0067 which is less than 0.05. This suggests that this variable is significantly associated with stock returns. Since the coefficient is positive (0.224), these variables are also positively associated. The sum of coefficients of earnings and changes in earnings (α1+α3) is 1.27 and positive. This suggests that the first hypothesis is accepted, i.e. earnings have incremental information content beyond that of cash flow from operations. Moreover, the sum of coefficients of cash flow from operations and changes in this variable (α2+α4) is 0.022 and positive. This suggests that the second hypothesis is also accepted, i.e. cash flow from operations has incremental information content beyond that of earnings. The empirical findings support theoretical speculations. The hypotheses of the present research were tested using the data from TSE-listed firms and using multivariate linear regression. The results showed that both earnings and cash flow from operations have incremental information content over each other. Overall, the fidings of this study support the usefulness cash flw information in addition to earnings in fim valuation by investors in the Iranian market. The literature supports the present findings. Cheng et al. (1996), Trabelsi (2013), and Mostafa and Dixon (2013) showed that earnings and cash flow from operations have incremental information content beyond each other. Other researchers such as Ali (1994), Haw et al. (2001), Arab-Mazar Yazdi (2006), Tehrani and Fani-Asl (207), and Pouraghajan et al. (2012) have provided evidence for the incremental information content of earnings beyond that of cash flows. The most important issue that may restrain the generalization of the present findings is the effect of excessive volatility of prices and uncontrollable factors that affect the returns of firms but are not incorporated into the model. Considering the importance of earnings and cash flow as important factors in the process of decision-making by users and creditors, future research can focus on the impact of earnings extremity on the information content of earnings and cash flows in the Iranian capital market. 1.Ali, A. (1994).The incremental information content of earnings, working capital from operations, and cash flows. Journal of Accounting Research, 32, 61-74. 2.Arab-Mazar Yazdi, M. (1995). Incremental information content of cash flows and accruals, Doctoral Dissertation. University of Tehran, Iran. 3.Arab-Mazar Yazdi, M., Mashayekhi, B., & Rafiei, A. (2006). Information content of cash flows and accruals in Iranian capital market. Iranian Journal of Accounting and Auditing, 43, 99-118. 4.Arthur, N., Cheng, M., & Czernkowski, R. (2010). Cash flow disaggregation and the prediction of future earnings. Accounting & Finance, 50, 1-30. 5.Board, J. L. G., & Day, J. F. S. (1989). The information content of cash flw fiures. Accounting & Business Research, 20, 3-11. 6.Board, J. L. G., Day, J. F. S., & Walker, M. (1989). The information content of unexpected accounting income, funds flow and cash flow: Comparative evidence for the U.S. and U.K. economies. London: Institute of Chartered Accountants in England and Wales. 7.Bernard, V. L., & Stober, T. L. (1989). The nature and amount of information in cash flws and accruals. The Accounting Review, 64, 624-652. 8.Cheng, C.S. A., & Yang, S. S. M. (2003). The incremental information content of earnings and cash flows from operations affected by their extremity. Journal of Business Finance & Accounting, 30, 73-116. 9.Cheng, C. S. A., Liu, C. S., & Schaefer, T. F. (1996). Earnings permanence and the incremental information content of cash flws from operations. Journal of Accounting Research, 34, 173-181. 10.Charitou, A., Clubb, C., & Andreou, A. (2001). The effect of earnings permanence, growth, and fim size on the usefulness of cash flws and earnings in explaining security returns: Empirical evidence for the UK. Journal of Business Finance & Accounting, 28, 563-94. 11.Fanatical Accounting Standards Board (FASB) (1987). Statement of Financial Accounting Standards, No. 95. 12.Haw, I. M., Qi, D., & Wu, W. (2001). The nature of information in accruals and cash flows in an emerging capital market: The case of China. The International Journal of Accounting, 36, 391-406. 13.Mostafa, W., & Dixon, R. (2013). The impact of earnings extremity on information content of cash flw. Review of Accounting and Finance, 12, 81-104. 14.Neill, D., Schaefer, T., Bahnson, P., & Bradbury, M. (1991). The usefulness of cash flow data: A review and synthesis. Journal of Accounting Literature, 10, 117-150. 15.Pouraghajan, A., Emamgholipour, M., Niazi, F., & Samakosh, A. (2012). Information content of earnings and operating cash flows: evidence from the Tehran Stock Exchange. International Journal of Economics and Finance, 4, 41-51. 16.Tehrani, R., & Fani-Asl, M. (2007). Relationship between cash flow from operations, accruals, and stock returns in the firms listed on Tehran Stock Exchange. Iranian Journal of Financial Research, 9, 21-32. 17.Trabelsi, J. E. (2013).The value relevance of earnings and cash flows: The Tunisian stock market evidence. Accounting & Finance, 4, 98-117. 18.Wilson, G. P. (1987).The incremental information content of the accrual and funds components of earnings after controlling for earnings. The Accounting Review, 62, 293-322.